I made a few cards using the new Stand and Salute cartridge. I wanted to try out the "Note Card" and the "Frame" creative features. When I first saw the Note Card creative feature I though it would cut an aperture card. The feature actually works as a way to create what I call a "card topper" to layer on your card base. Once this cartridge is added to Design Studio we will be able to adapt most of these designs into full card cuts. 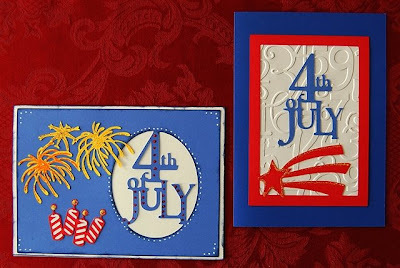 Above you can see the "4th of July" Note Card cut at five inches. This turned out to be a bit too big to layer on a premade 5 x 7 card so I cut it again at 4 3/4 inches - that size fits nicely with a bit of a border. 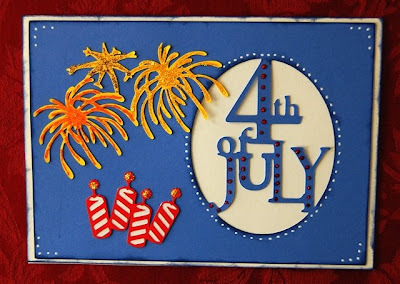 Here is the card I made using this topper, a fireworks border cut (I removed one small section) and the firecrackers. 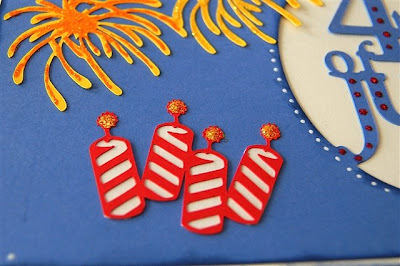 There is not a layer for the firecrackers but I was able to cut small pieces of white cardstock and adhere them to the back - once again, when this is in Design Studio we should be able to make a blackout version by hiding contours. 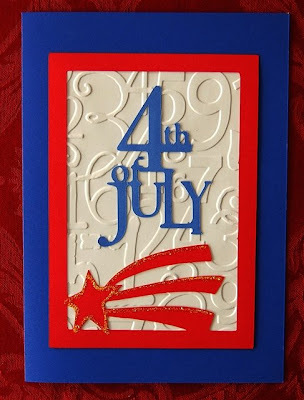 I used some inking, white pen dots and Stickles glitter glue to embellish the card - it is fun to put the Stickles on the fireworks - they really "pop" (but it is hard to catch in a photo). For the second card I used the shooting star on the Frame creative feature. I cut it at five inches, intending to put it on an A2 card but the proportions were a bit off - it works nicely on the 5 x 7 card. 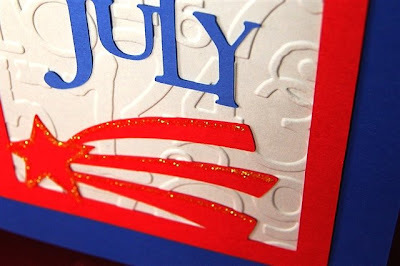 I added Stickles again on the shooting star and cut the basic 4th of July at three inches for the top of the card. I used the "number collage" Cuttlebug folder to emboss the piece of white cardstock I place behind the frame. I have made a lot more trial cuts - the layers are great on this cartridge! I will be back to add some more projects later today - one of them uses "Stand and Salute" with no trace of red, white and blue(!). Great job!!! I love it!! These look great!! :) The cuttlebug is something I'm going to have to invest in, the backgrounds are so neat! I attended your class this morning (well afternoon... haha) and REALLY enjoyed it! I can't wait to attend more. Thanks again (to you and Jen) for coming up with the classes. I know it will help a ton of people! Cute cards! 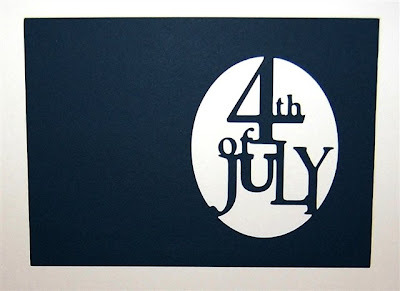 Fourth of July is my bday and my favorite holiday (of course! LOL! ), just one more reason to love this cart! The frames are fun and I love how you embossed the background with the numbers. TFS! LOVE these cards, Diane. As usual they look beautiful. I have ordered this cartridge (based on what I've seen you do with it) and should get it sometime this week. I can hardly wait. Thanks so much for sharing with us.